In September, Barcelona created a new SuperBlock, a car-free area designed to maximise public space. The SuperBlock covers 40 acres of Barcelona’s El Poblenou neighbourhood, and was the first step in a bigger plan to install at least six SuperBlocks across Barcelona by 2018. The implementation of the SuperBlock has been the core of many debates about the qualities of massive pedestrianisation, dynamic urban spaces and citizen engagement. In order to go beyond the limits of already existing techniques regarding citizen participation, IaaC’s Design for the Responsive Cities seminar aimed to develop and understand how gaming technologies can become a tool for the designer to share and evaluate the design process through user’s feedback or vice-versa. Allows the players to recreate the SuperBlock in their own unique vision. Allows the tracking of the player’s choices and moves, in order to guide real proposals for the Superblock. In an effort to create a game that represents the reality of the SuperBlock and of it’s users, the students took to the streets conducting a survey. The aim of the survey was to create a deeper understanding of the people’s opinions about their neighbourhood’s ecology, social interactions as well as mobility and productivity. After the survey was completed, the results were used to guide the creation of the game. 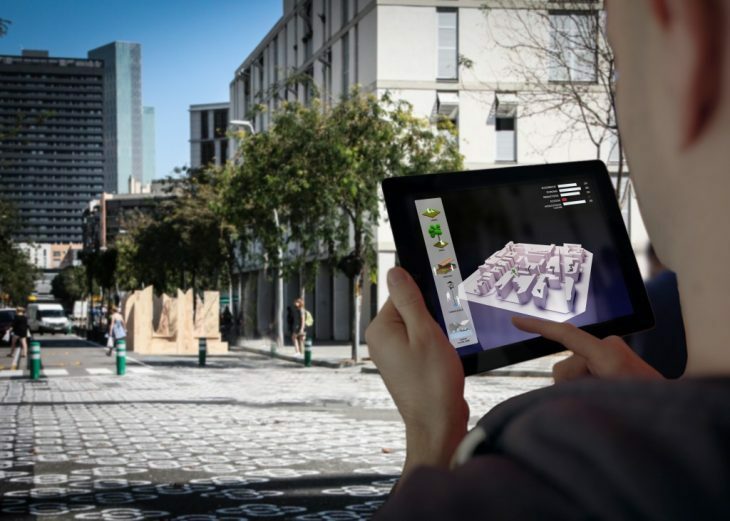 SuperBarrio, is a tablet game that immerses the players inside a 3D recreation of the Superblock, calling them to insert a variety of modules that have either a positive or a negative effect on the environment. The modules are divided in four main categories: ecology, productivity, social & culture and mobility and their design is based on a reflection of the survey’s results. The goal of SuperBarrio is to create a balance between the modules and therefore an environment that is balanced and unique at the same time. SuperBarrio was launched at a public event in Sopa, a restaurant inside the Superblock, in order to test it’s impact on the people’s perception of the Superblock. The people’s reactions showed that, given the right approach, the people have the will to share their creativity and their opinion on public matters. People were enjoying the game, exploring how to create synergies between the modules, affecting the environment and unleashing their creative capacity. Following the launch, the MaCT students collected the data captured from 75 players and visualised it in an effort to represent the reflection of the people’s proposals for the SuperBlock. The data was used to identify the main preferences of the players, either in category(ecology, productivity, social & culture and mobility) or in individual modules (trees, wind turbines, bike stations, etc.) or lastly in location. The aim of the collection of this data is to create a new way for the people to share their creativity for neighbourhood’s public space. Therefore, a Facebook page has also been created in which the players are able to share the environment that they created with the other players and create a healthy debate on the spectrum of possibilities of the SuperBlock. SuperBarrio, is a game that could operate as an informal tool for urban design proposals. By improving it’s fluidity, by increasing the amount of people that access it and by introducing even more creative layers in the game, it can surely be transformed into a reliable tool that immerses the player in a world where he/she is the urban planner and the decision maker of the neighbourhood. You can explore the world of SuperBarrio at the Google Play store.